Local history note on Edmund Kean. Edmund Kean was well past his prime when he came to live at Richmond as manager of the Theatre Royal, but his associations with that theatre had begun 17 years earlier when he was still at the height of his powers. Although he achieved overnight fame at Drury Lane in 1814, Kean's success was not one of an inexperienced upstart, for he had served a long hard apprenticeship as a player in the provinces. Whilst still an infant he had been virtually adopted by Charlotte Tidswell, a minor member of the Drury Lane company. A strange, enigmatic figure, she is referred to by Kean in his letters as simply "Miss Tidswell", but by his wife as his "aunt". Whether or not there was any blood link, it is clear that there was a very close and enduring relationship between Kean and Miss Tidswell. She was one of the few people who knew how much truth and how much hearsay lay behind the now generally accepted story of his origins: that he was the son of Edmund Kean, a popular speaker at the debating clubs who died insane at the age of 23, and of Anne Carey, a third-rate actress who performed at provincial theatres and at London fairs. The earliest surviving playbill on which Kean's name appears is dated 8 June 1796 and advertises a performance of The Merry Wives of Windsor in which "Master Kean" is to play Robin. At Sheerness on Easter Monday 1804, as "Carey" (a name he used intermittently throughout his early years) he appeared with Jerrold's company in George Barnwell. For the next 9 years he laboured on in obscurity. In 1805 he played at an amusement hall in Camden Town, then later with Michael Atkins's company in Belfast. In 1806 he played minor parts at the Haymarket, later joining the Kent company run by the eccentric Miss Baker. From 1808 to 1813 he was successively a member of various companies on the West Country circuit, including those of Beverley, Watson, Cherry and Hughes. It was while he was with Henry Lee's company in Dorchester that, on the night of 15 November 1813, while playing Octavian in The Mountaineers and Kojah in The Savages he was seen by Arnold, the Drury Lane manager. This occasion led to his engagement at Drury Lane, a theatre that at the time was lacking in players capable of sustaining a tragic role. "In giving effect to the conflict of passions arising out of the contrast of situation, in varied vehemence of declamation, in keenness of sarcasm, in the rapidity of his transitions from one tone and feeling to another, in propriety and novelty of action, presenting a series of striking pictures, and giving perpetually fresh shocks of delight and surprise - it would be difficult to single out a competitor." After a season in Dublin, Kean returned to England for his second triumphant season. The people of Richmond and its neighbourhood had doubtless heard of the young actor's success at Drury Lane and on 14 October they had the opportunity of seeing the phenomenon in action at their local theatre, thanks to its enterprising manager, William Roxby Beverley. Kean's next appearance at Richmond, in October 1817, was made whilst the theatre was under the management of Charles Klanert, an illustrious period which lasted from June 1817 to November 1829. Klanert was prepared to pay high salaries to attract actors of the calibre of Eliza O'Neill, Maria Foote and John Liston. 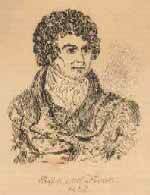 Besides his performances in 1817, Kean played at Richmond in 1818 and 1820. Some 8 years elapsed (including 2 American tours) before he was next engaged by Klanert. By this time the rigours of his career and his chronic addition to alcohol had rendered him incapable of memorising a new part, a sad fact painfully demonstrated by his disastrous 1827 performance in Grattan's tragedy Ben Nazir. The parts that he played at Richmond in 1828, however, were ones which had been in his repertoire for some time: Shylock and Mortimer in The Iron Chest. June and July 1830 saw Kean's "farewell season" in London, consisting of performances of Richard III, The Merchant of Venice, Othello, A New Way To Pay Old Debts and King Lear, all at the Haymarket, and climaxed at the nearby King's Theatre by a programme made up of excerpts from some of the plays in which he was best known. This season in London was followed by a "farewell tour" of the provinces. "Having heard that the Theatre Royal, Richmond is in the market, I should gladly offer myself as candidate…"
"Mr Kean, having heard that the Richmond Theatre is on the market, has desired I would write to say…he will take it off your hands." His application was accepted and he took up residence in the adjoining house. He formed a company and his first season began on 18 July 1831. Although during his two seasons' management he made a profit of over £400, the house was frequently little more than a quarter full. The most successful night was his benefit on 14th November 1832, when the takings were £76 17s, still short of the £90 capacity. In 1832 Kean continued a local tradition at Richmond by giving a prize wherry to be rowed for by the watermen. On the evening of Friday 10 August, the prize boat was brought unto the stage of the theatre and presented to the successful competitors, "Rule Britannia" being sung by the whole company. "a small pale man with a fur cap, and wrapped in a fur cloak. He looked to me as if come from the grave. A stray lock of very dark hair crossed his forehead, under which shone eyes which looked dark, and yet as bright as lamps. So large were they, so piercing, so absorbing, I could see no other feature." Kean's last season at Drury Lane opened on 5 November 1832. He was now failing fast. During a performance of Richard III at Richmond on 12 March 1833 he was obliged to quit the stage, finding himself physically incapable of continuing. In spite of this, a performance of Othello at Richmond was announced for the 15. Then on Monday 25 March came the performance which was to be his last, Othello at Covent Garden. Kean was playing the Moor, his son Charles, Iago and Ellen Tree (later Mrs Charles Kean), Desdemona. The elder Kean collapsed during the second act and was carried to the Wrekin Tavern in Broad Court where he was put to bed. On the following Saturday he was taken back to Richmond and on 2 May he was visited by his wife, from whom he had become estranged, and his son. On Wednesday 15 May he died, in the presence of John Lee and the surgeon Mr Douchez. Kean's funeral on Saturday 24 May was almost a state occasion. The shops in George Street were closed and 20 townsmen were sworn in as special constables. At 3 o'clock the funeral procession started from the Green and made its way to Richmond Parish Church, where the body was to be interred. Among the pallbearers was MacCready and behind the coffin walked Charles Kean, supported by Sheridan Knowles and John Lee. They were followed by the chief mourners, Kean's physicians, members of the Drury Lane Fund Committee, actors from every London theatre and, lastly, the inhabitants of Richmond. Ann Carey, Kean's mother, died on 23 May and was buried in the Richmond Parish churchyard on 27 May 1833. In 1839 Charles Kean erected a memorial to his father on the outside of the church; later it was moved inside, where it now remains as a fitting reminder of one of the most exciting figures in theatrical history.